Added on 29 November 2018 . By Ed Christmas. I’m all for thinking a little outside the box, but looking at the outside of St. Paul’s Trading House - formerly a Bank of New Zealand - you’d be forgiven for thinking you were headed for another low-key City drinking den. Once inside though, you could not be more mistaken, as this unique bar and restaurant houses a haven of taxidermy, leafy foliage and trinkets inspired by the international jet-setters of old. The first thing that caught my attention, almost grinding me to a complete stop, was a giant bird floating above the bar. Quite frankly, it’s a feature that is impossible to miss. After being shown our seats - followed by the obligatory “Is your last name really Christmas? !” from the waiter - I found myself in further awe of the surroundings. 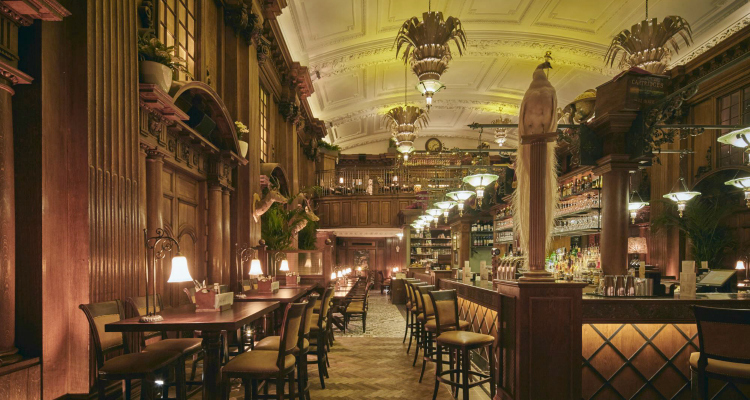 With the taxidermy, low-lighting and skilled pianist giving us his take on ‘Blue Suede Shoes’, it makes quite the impact; the ornate Victorian ceiling only adding to the striking but subtle vibe of the space. One of The City's quirkiest boltholes, Phileas Fogg meets contemporary dining at The Trading House. We all know what the cocktail scene was like this summer, with tipplers attempting to find the latest rooftop terrace or sunshine drinking spot to whet their whistles in. But, in true Game of Thrones-style, winter has come. Rooftops feel like a thing of the past and it’s left us Millennials wheeling around in search of our next cocktail fix - The Trading House is a sure-fire place to start. Its comprehensive drinks menu features influences from across the globe, such as The Light That Shines (£9.95). Inspired by Diwali, this Bombay Sapphire and poppy liqueur-infused concoction would make the eyes of any Instagram-lover light up. Deemed to bring good fortune, their Thai-influenced tincture, Nang Kwak (£12.50), is also worthy of a shout-out. 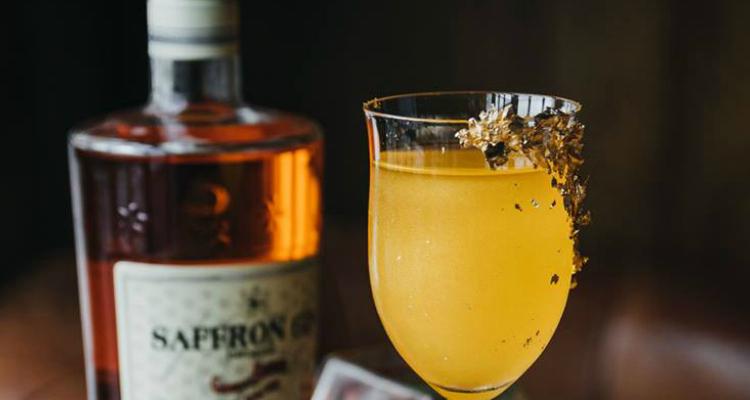 Mixing my favourite Saffron gin with bergamot and white chocolate liqueurs, saffron syrup and Champagne, it made for a vibrant combination as sweet as sugar. The Trading House cocktail menu takes inspiration from across the globe, like this Thai-influenced saffron number. Served with just the right amount of sour cream dip, the calamari (£7.50) fell apart in my mouth. As for the mains, their signature Hanging Chicken Kebab (£12.95), smothered with a sweet chilli sauce and served with seasoned fries and garlic butter, will incite the salivary glands of foodies far and wide. I was, however, more tempted by the tender sirloin steak (£19.50), which was seasoned with gravy. Yes, gravy. Having spent several years in the North, I have learnt that gravy shall and must go with everything. 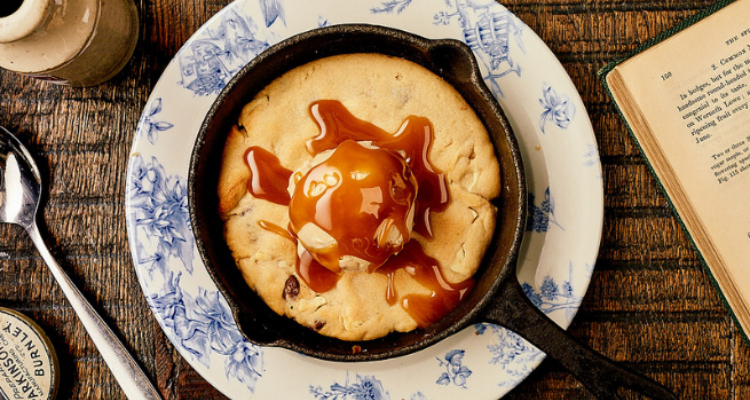 The Baked Chocolate Chip Cookie Dough (£4.95) is a dish that will make your jaw drop when it arrives in front of you. While ordering it may make you feel as basic as the blonde girl in front of you in Starbucks getting her Chai Latte, it’s a feeling you quickly move past once you dig in. I’m not one with a sweet tooth, but was left demolishing the whole thing and then wondering where it all went. For all their exotic flavour combinations, nothing beats this classic sweet treat. The Trading House may be aiming for that worldly and well-travelled vibe, but what vibe did it give me? For one, the food is great, but equally the atmosphere was truly unique and something I’ve not experienced in London for a while. It’s safe to say, if you’re planning a visit here, leave the tracksuits at home and, please, wear loose trousers if you’re eating.